I've got some more Pretty and Polished fall releases to share with you today! Three of them are apple-themed, and one is pumpkin related. I'm hungry already. 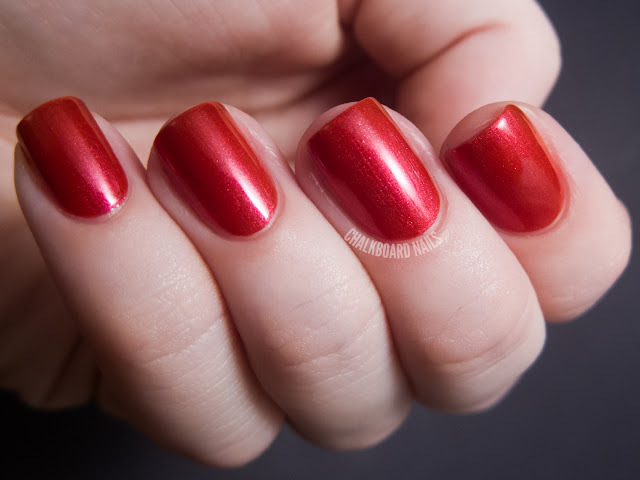 Candy Apple is a rich red shimmer. It is almost a bit metallic, but doesn't show stroke lines. It's quite rich and beautiful, and covers really nicely in just two coats. 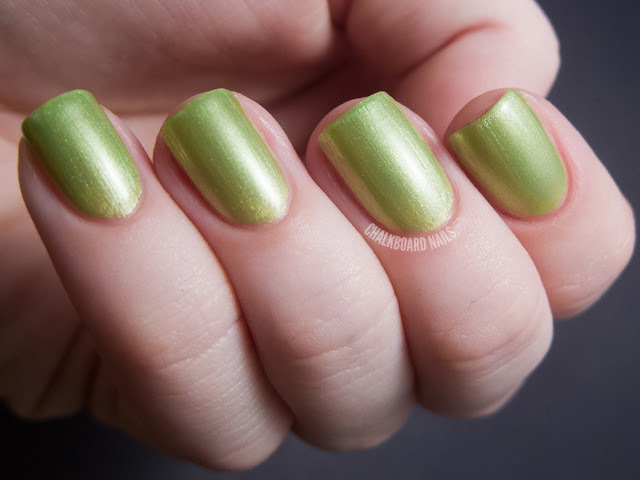 Granny Smith is a yellow-toned green polish with the same sort of finish as Candy Apple -- heavy on the shimmer and almost metallic. It's very crisp and definitely well named! I used three coats with this polish. 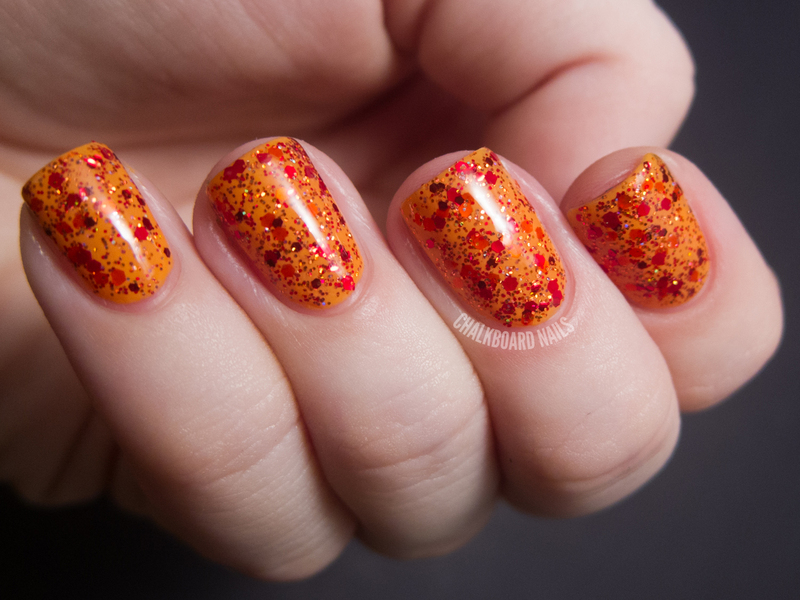 Pumped Up Pumpkin is a super dense glitter made up of oranges, reds, and small, ultra sparkly glitters. I have shown it here over Zoya Arizona. It applies so easily and is really eye catching. This is just one coat, it's that dense! 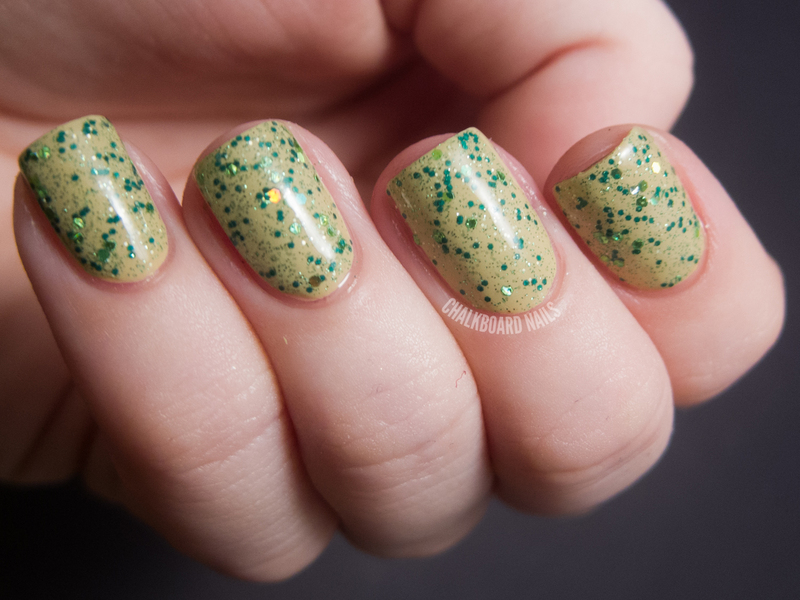 Apple of My Eye is a green glitter polish with a micro glitter base. There are a few sizes of green in this one. This swatch shows it layered over China Glaze Kalahari Kiss. I like the foresty tones of this one and the overall small sizes of the glitters. Pretty and Polished lacquers are sold on Etsy, and at the time of this post, all four of these are in stock. You can also like Pretty and Polished on Facebook for brand news and announcements. Great swatches! I really like Pumped Up Pumpkin. Pumped Up Pumpkin is so cute! This post makes me want to go out to an apple orchard and carve pumpkins! It's starting to feel like fall around Chicago! They're all so gorgeous!!! Really love Candy Apple. The polishes are great but your cuticles are epic! Great swatches as usual I love Apple of My Eye. Gahh, I feel like I can SMELL the apples looking at these colors. Definitely want to check them out now!